On 1st September 2017, Martin Simpson releases his 20th solo album. It’s his first release since 2013’s “Vagrant Stanzas”, and is being released just a few weeks after he headlines this year’s Cambridge folk festival. As well as his 40 year solo career he’s been involved in projects such as The Full English, and has worked with artists including Bonnie Raitt, Richard Thompson, June Tabor, Jackson Browne and many more. 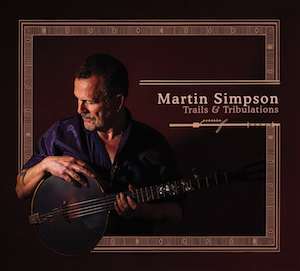 The music is absolutely superb and Martin Simpson plays a range of instruments including acoustic, resonator and electric guitars, Weissenborn lap steel guitar, five-string banjo and ukulele. That mix of instruments is impressive enough even before he brings in other musicians such as Nancy Kerr playing viola and fiddle. The mix of instruments helps give each song an individual character that is often hard to do on albums where the performer is just sticking to one or two instruments. If you had to pick a single voice to typify folk music then Martin Simpson's voice is a strong contender - it just suits English folk music perfectly. When you combine the music on this album with his vocals, the result is excellent. It's a really enjoyable album and one that demonstrates why he's such a popular musician.